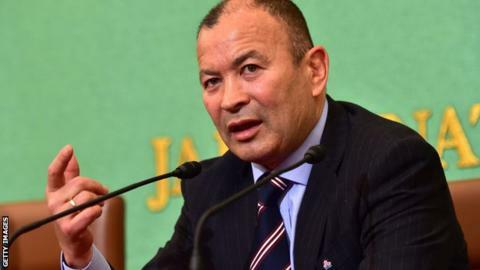 Eddie Jones - the right man for England or just someone different? So Eddie Jones has gone from South Africa's Stormers to England's strugglers, from Cape of Good Hope to capable of good, it is to be hoped. The deal has been concluded fast but it is no less momentous for it. Never before have the England rugby union team been led by a foreign coach. That they will be now owes much to Jones' considerable coaching experience and something to his availability compared to that of the other dream candidates. It is also down to the flip-flop - not the rubber-soled footwear favoured on the beaches of Jones' native Australia, but the habit of those in charge of such appointments in English sport to go for the polar opposite of whoever was deemed to have last failed in the job. This is a strategy perfected by the Football Association and borrowed by others since. You can trace the about-turns back through the years: low-cost and low-key Roy Hodgson replacing the expensive and autocratic Fabio Capello, a vastly experienced overseas name to take over from the callow and outclassed Englishman Steve McClaren, himself the bellowing antitheses of detached Sven Goran Eriksson, who got the job in the first place because he was considered a calm tactical genius compared to the heartfelt yet naïve Kevin Keegan. Keegan, man of the people, replaced the eccentric and isolated Glenn Hoddle. Born-again Christian Hoddle succeeded Terry Venables - who had stepped down to clear his name in connection with off-field business dealings. Venables' overseas experience and attractive style of play contrasted with the long-ball British basics of Graham Taylor. And so on, and so into other sports. England cricket swapped taciturn foreigner Duncan Fletcher for the ebullient and homegrown Peter Moores. When Moores proved short of international nous and clout, he was replaced by flinty Zimbabwean Andy Flower, former number one-ranked batsman in the world. Then, when Flower was deemed too dour, the cheerful Moores was brought back, swiftly to be ditched again when the same failings became apparent - and succeeded this time by a wise old Aussie in Trevor Bayliss. The RFU has long done the same, ever since Sir Clive Woodward flounced out of the Twickenham hot-seat. Andy Robinson too dour? Bring in the attacking ethos of Brian Ashton. Ashton lacking authority? Call for the dark charisma of Martin Johnson. Johnson exposed in the first coaching job he had ever done? Time for Stuart Lancaster, a grassroots coach with minimal public profile. Which takes us to Jones. Lancaster had one season of Premiership experience before he was given the England job, a season which ended in a cash-strapped Leeds side being relegated back to the Championship. He had never before been to a rugby match at the Millennium Stadium or the Stade de France. Jones? Jones has coached everywhere - at two different Super Rugby teams in Australia, as an assistant to Jake White for the South African national side, in England with Saracens and with Japan in the three years leading up to the last World Cup. He has taken the Wallabies to one World Cup final and helped the Springboks win the next in 2007. Whether he is the right man for England is less clear. No other union has the financial or playing resources enjoyed by the RFU. It is one of the reasons why, unlike Wales, Scotland and Ireland, it has always reached into its vast hinterland for the man to lead its national side. Even now the logic can be questioned. RFU chief executive Ian Ritchie insisted that Lancaster's replacement must have international experience. That makes sense if Lancaster's shortcomings were the only benchmark - but not on other criteria. Lancaster failed for a variety of reasons. Not all of them are present in every other English coach, just because they share the same nationality. Speaking to BBC Radio 4's Today programme in October: "If you look at English sport there's some general things that England sides are pretty good at in rugby... normally they have that bulldog spirit, they have strong set piece, strong defence and then you build the game around that. I think that's probably what's been missing from the England sides for the last 12 years really, since 2003." Had Wales gone with the same approach as Ritchie, they would not have appointed Warren Gatland, the man who has led them to two Grand Slams in England's barren years and a World Cup semi-final despite far smaller resources. It would have meant Ireland passing up Joe Schmidt, who took them to the Six Nations title last spring, and would have kept Scotland from the wisdom of Vern Cotter, who was one questionable refereeing decision from steering his adopted nation into their own World Cup semi-final. Michael Cheika, universally lauded for his revitalisation of the Wallabies over the past year? Never coached at international level before. Woodward, who dragged the ship to its high water mark? International novice when he took the helm. Jones has enjoyed great success, most recently in inspiring Japan to the greatest upset the World Cup has ever seen, their 34-32 triumph over South Africa two months ago. He deserves great credit for both their unparalleled success and the style in which they did it. Will the same work in the vastly different set-up around England, where he will have neither the same control over his players nor the same eager players to mould in his image? His Brumbies side of the late 1990s was one of the best that Super Rugby has seen. That alone will not conjure him up a breakdown specialist like the great George Smith if, as it seems, he deems current captain and incumbent Chris Robshaw as lacking the necessary specialist skills. Jones: Saviour or school teacher? Because he has endured failures too. Japan may have won more matches at the World Cup than England, but Jones was also sacked by Australia in 2005 after eight defeats in nine, and resigned from the Queensland Reds in 2007 after they finished bottom of the Super 14 table. Choosing the coach is the easy bit. Changing the system he operates in so that it produces more world-class players capable of playing with same skill-set as world champions New Zealand is arguably more important but also a lot more difficult. Just like those players, a coach needs the right environment around him to flourish - a serendipitous blend of human and financial resources, the right specialists below him, the right leader above. Otherwise we flip-flop again, and one pair of those is enough for anyone. Read more on Eddie Jones: England's saviour or 'another school teacher'?